Emerson Fittipaldi is a semi-retired automobile racing driver who won both the Formula One World Championship and the Indianapolis 500 twice each and the CART championship once. Moving up from Formula Two, Fittipaldi made his race debut for Team Lotus as a third driver at the 1970 British Grand Prix. After Jochen Rindt was killed at the 1970 Italian Grand Prix, the Brazilian became Lotus' lead driver in only his fifth Grand Prix. He enjoyed considerable success with Lotus, winning the World Drivers' Championship in 1972 at the age of 25, a youngest F1 world champion record that he held for 33 years. He later moved to McLaren for 1974, winning the title once again. He surprised the paddock by moving to his brother's Fittipaldi Automotive team prior to the 1976 season, being replaced by James Hunt. Success eluded him during his final years in Formula One, with the Fittipaldi cars not competitive enough to fight for victories. Fittipaldi took two more podium finishes, before retiring in 1980. Following his Formula One career, Fittipaldi moved to the American CART series, achieving successful results, including the 1989 CART title and two wins at the Indianapolis 500 (in 1989 and 1993). 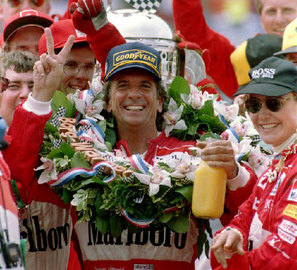 After the latter victory, Fittipaldi angered American motorsport fans by breaking Indianapolis tradition when he drank a glass of orange juice instead of the ceremonial milk. After retiring from Indy Car racing in 1996, Fittipaldi races only occasionally. Aged 67, he entered the 2014 6 Hours of São Paulo.